The tour begins in Downtown Manhattan, where you will learn about some important landmarks before making your way towards the Brooklyn Bridge. Then spend about 45 minutes learning about and walking over the famous mile-long bridge. Take time to stop for great photos, learn about the tragedies and triumphs involved in the construction of the bridge and about the incredible role and contributions of the Roebling family. You'll come away knowing all about the "bends". The rest of the tour is spent in Brooklyn, exploring two very distinct neighborhoods -- the formerly industrial and now trendy DUMBO and the 19th-century charming, historic district called Brooklyn Heights. Along the way, stop for a nice little treat and a great cup of coffee (optional, not included) at a popular DUMBO cafe, then check out the amazing skyline views from the Fulton Ferry Landing in Brooklyn Bridge Park. Choose from a 3-or-4-hour tour with just you and your party. 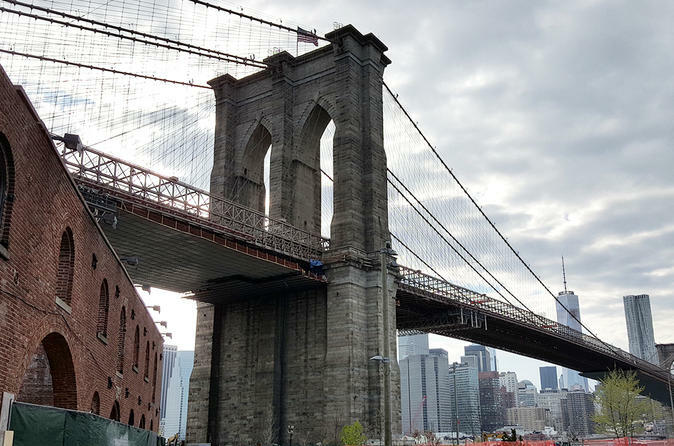 This tour combines history, sightseeing, memorable stories, architecture and provides tour participants with a solid understanding of New York and Brooklyn history, as well as the importance of the Brooklyn Bridge (a story we guarantee you won't forget). It is ideal for first-time visitors and repeats alike.